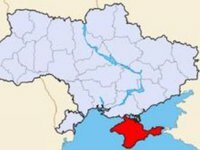 The United States supports the sovereignty and territorial integrity of Ukraine and will never recognize the annexation of Crimea. "Five years ago, Russia organized an illegitimate referendum on the annexation of Crimea. The United States does not and will not recognize the Kremlin's control of Crimea," the Twitter account of the U.S. Embassy in Ukraine says. "We expressed clear and unwavering U.S. support for Ukraine's sovereignty and territorial integrity during the visit of the USS Donald Cook to Odesa," it says.